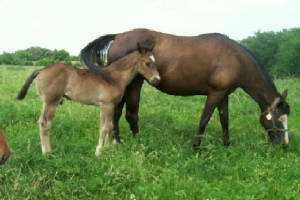 We accept monthly or weekly payment's on our foals , until they are weaned at usually 3 to 5 month's of age. Our Mare's are vaccinated with Triple E FT and West Nile. They are wormed every three month's with Ivermec. They have their feet trimmed every 8 to 10 weeks. I check on them twice a day on my 4 wheeler. Within week's the foals start coming up to me to investigate. They are very curious. I just love it when I am surrounded by all the baby's. Please welcome our first foal. 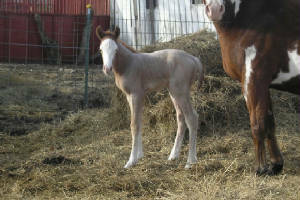 He was born 2/20/06 and his dam is Poco Pine Force(Force), His sire is Winchesters Stormking. 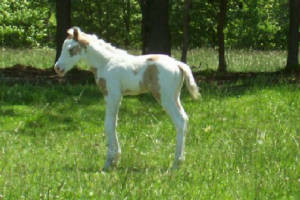 This colt is a Gray Overo. 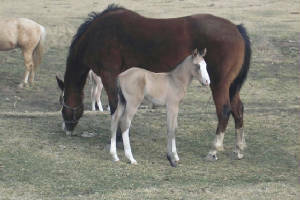 Please welcome our second foal born 2/28/06. Dam: I B BROOKES SPIRIT(Spirit) and Sire:HAWKEYES STREEK. Just hours old in this photo. 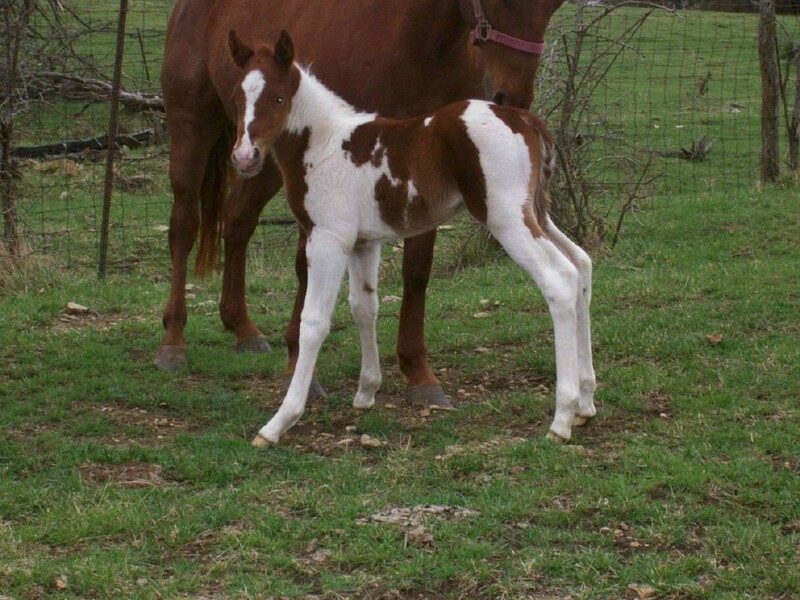 A real nice Red Roan Filly. Please welcome our third foal. He was born 3/4/06. His Dam is LADY DI SIEMON (Lady Di) and his Sire is HAWKEYES STREEK. 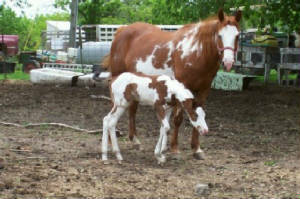 This colt is a solid Red Roan. Please welcome our 4th foal. He was born 3/5/06. His Dam is CHIEF SWEETY and his Sire is HOPES PEPPY ZAN. He is a solid buckskin colt. Please welcome our fifth foal. He was born 3/9/06. His Dam is TEENAS TWO EYED RED and his Sire is HAWKEYES STREEK. This colt is a solid bay roan. Please welcome our sixth foal. She was born 3/10/06. 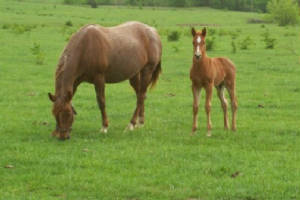 Her dam is SONNYS ROYAL WILDFIRE and her Sire is WINCHESTERS STORMKING. 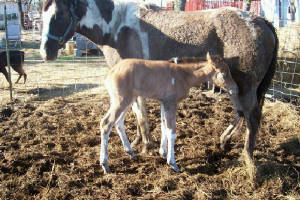 This filly is a Gray Tovero. Please welcome our seventh foal. She was born 3/14/06. Her Dam is CHALLENGERS SAL and her Sire is WINCHESTERS STORMKING. 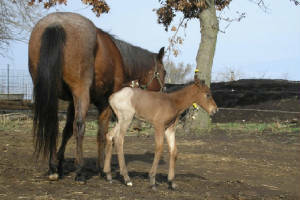 This filly is a Gray Tovero. Please welcome our Eighth Foal. She was born 3/16/06. Her Dam is CLOIE WIMPY MCCUE and her Sire is HAWKEYES STREEK. 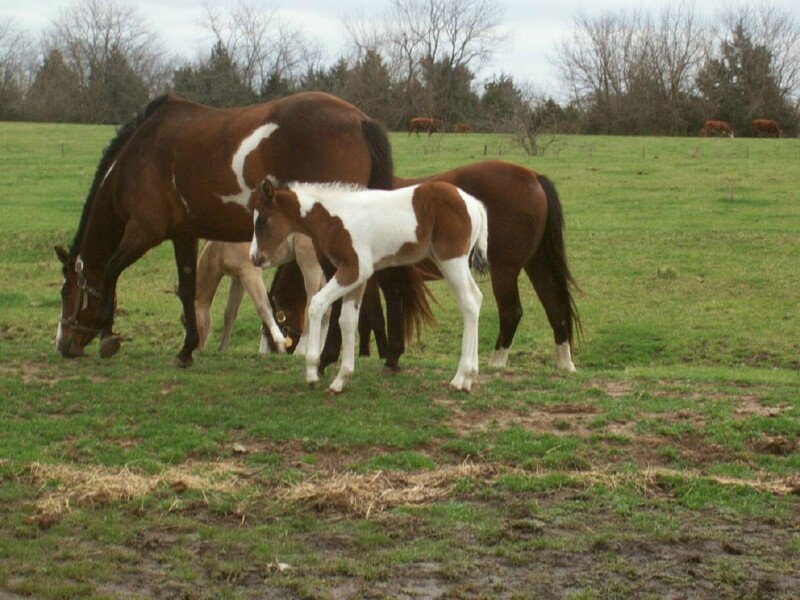 This filly is a Dun Roan Tobiano. Please welcome our ninth foal. She was born 3/21/06. Her Dam is CHIEFS SKY DIXON LB and her Sire is MCCUES MOONLITE SAM. 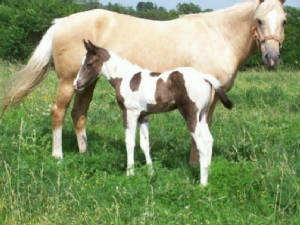 This filly is a Buckskin Tobiano. Please welcome our tenth foal. She was born 3/24/06. Her Dam is MY SWIFT BRITCHES and her Sire is WINCHESTERS STORMKING. This filly is a Solid Gray. Please welcome our eleventh foal. He was born 3/28/06. His Dam is ROYAL T TUFF (CHEYENNE) and his Sire is WINCHESTERS STORMKING. 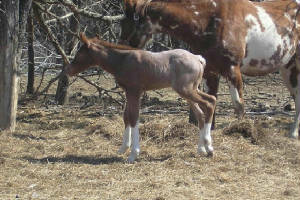 This colt is a Bay Tovero. Please welcome our 12th foal. He was born 3/31/06. His Dam is Tarren Zanna and his Sire is Winchesters Stormking. 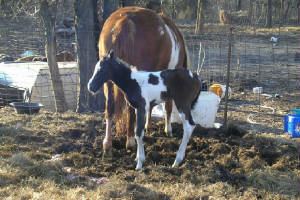 He is a Sorrel Tobiano Colt. Please welcome our 13th foal. 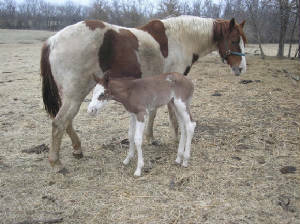 She is a AQHA bay filly, born 4/3/06. Her Dam is Shot Of Parr and her Sire is Yellow Jaybird. Please welcome our 14th foal. 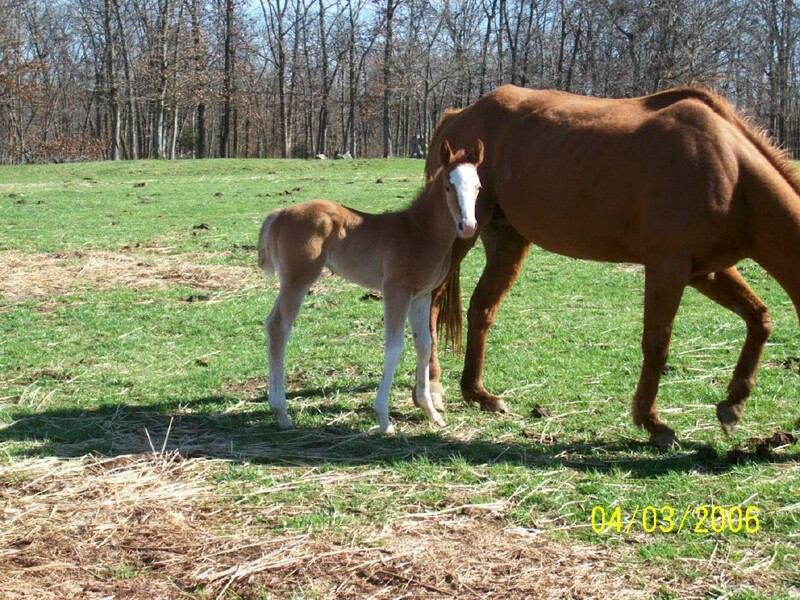 He is a Red Roan AQHA stud colt, born 4/15/06. His Dam is Nellie Sue Bonanza and his Sire is Yellow Jaybird. Please Welcome our 15th foal. 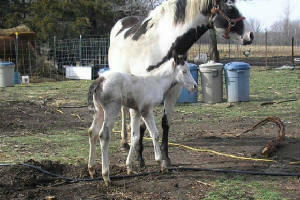 She is a Gray Tobiano Filly, born 4/17/06. Her Dam is Glamorous GoGo Girl and her Sire is Winchesters Stormking. Please welcome our 16th foal. He is a Bay Tovero Stud colt, born 4/28/06. His Dam is Tuffers Chick and his Sire is Cir K Pepper. Please welcome our 17th foal. He is a Solid Black stud colt, born 5/9/06. His dam is Lucy Tea Mccue and his sire is Cir K Pepper. Please welcome our 18th foal. 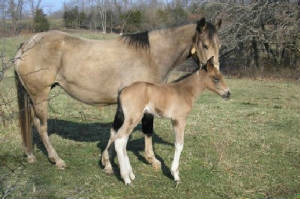 He is a Buckskin Tovero stud colt. His Dam is Bucks Thunderbolt Go and his Sire is Hopes Peppy Zan. Please wecome our 19th foal. 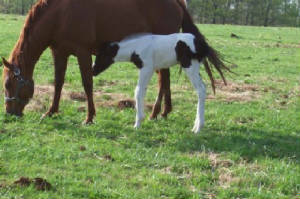 He is a Black and White stud colt. His Dam is Princess Matador and his Sire is Mccues Moonlite Sam. To read our foal contract or if you have any questions regarding any foals , please feel free to contact us below. 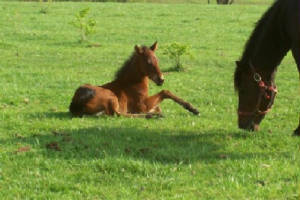 We are looking for name's for our foals. We like to keep the Sire's name and Dam's name in the foals registered name. The name can only be 30 characters long. If you know any good name's. We would appreciate all the help we can get. Please contact us.